Rabbi of Kaliska, Prussia, in the eighteenth century. 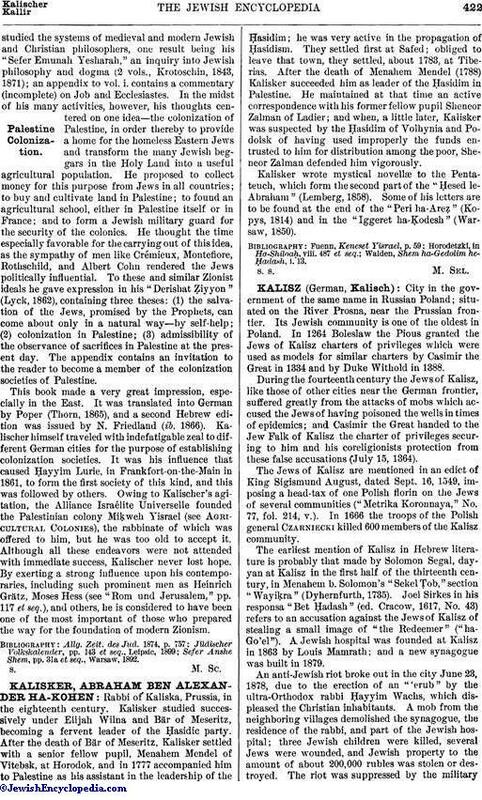 Kalisker studied successively under Elijah Wilna and Bär of Meseritz, becoming a fervent leader of the Ḥasidic party. After the death of Bär of Meseritz, Kalisker settled with a senior fellow pupil, Menahem Mendel of Vitebsk, at Horodok, and in 1777 accompanied him to Palestine as his assistant in the leadership of the Ḥasidim; he was very active in the propagation of Ḥasidism. They settled first at Safed; obliged to leave that town, they settled, about 1783, at Tiberias. After the death of Menahem Mendel (1788) Kalisker succeeded him as leader of the Ḥasidim in Palestine. He maintained at that time an active correspondence with his former fellow pupil Sheneor Zalman of Ladier; and when, a little later, Kalisker was suspected by the Ḥasidim of Volhynia and Podolsk of having used improperly the funds entrusted to him for distribution among the poor, Sheneor Zalman defended him vigorously. Kalisker wrote mystical novellæ to the Pentateuch, which form the second part of the "Ḥesed le-Abraham" (Lemberg, 1858). Some of his letters are to be found at the end of the "Peri ha-Areẓ" (Kopys, 1814) and in the "Iggeret ha-Ḳodesh" (Warsaw, 1850). Walden, Shem ha-Gedolim he-Ḥadash, i. 13.